Where it all begins. 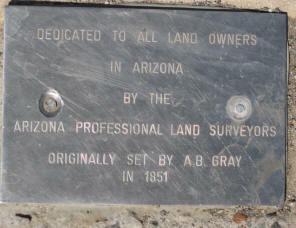 . . A trip to the baseline monument, from where ALL Arizona land is measured! 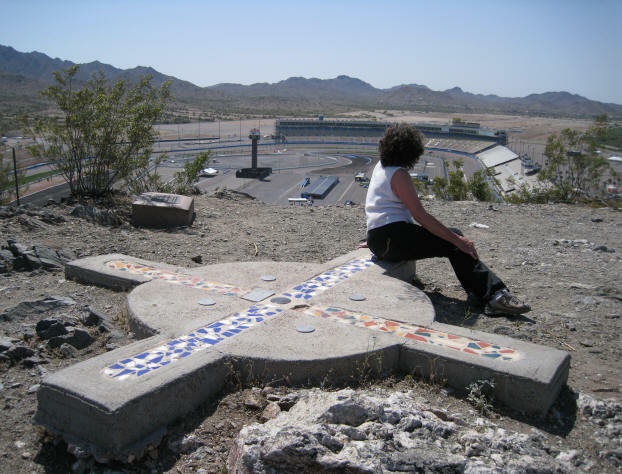 Avondale- A simple concrete cross on a small mountaintop near Phoenix International Raceway, marks the site of the cadastral survey marker. A single point, on Monument Hill, marked by an inset brass marker, where all land in Arizona was surveyed from. 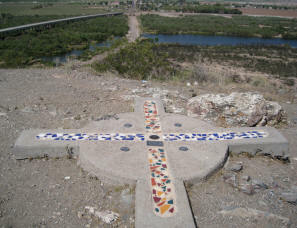 This current marker onto the 150-foot-high-hill, was constructed in 1984, but the original marker was placed in 1865, after Arizona was deemed a territory. According to the Arizona Republic (Jan.16, 2009), "surveyor William H. Pierce was paid $7500 in 1867, to survey two lines beginning at the marker, one line running 36 miles to the east, and another running 96 miles north." He and a crew moved rod and chains along the lines, sometimes with U.S. Army bodyguards to protect them from possible Indian attacks. To hike the monument today, head south on Avondale Blvd, and enter the parking lot of the Phoenix International Raceway, near Gate 8. Proceed to the parking area around the left side of the hill. Be sure to take extra water and sturdy shoes, as the trail is straight up the broken rocks, and not well maintained. The number one phrase we have heard for the last year in local real estate is: "I'm waiting for the bottom," but now, at least in our area, we think it's arrived. I remember going out of town last June and checked the total number of homes and condos for sale in the county. It was around 57,000 units. 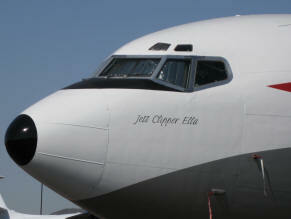 Five or six months later, it was still around 57,000 units. Then property started to move. Now, we're around 47,500 units and anything priced under $ 600,000, especially REO's, are on fire! I saw one foreclosure in Dove Valley last week priced at $ 185,000, and the price now has been raised to $215,000. Investors are snapping up short sales and bank-owned property, with construction crews on stand-by, for when the property closes escrow. They swarm onto the property, fixing and painting, and within a matter of weeks, the home is back on the MLS for sale again. The flippers are here. It's a sure sign of a buyer's market. And now, we're hearing of multiple offers to get a property. 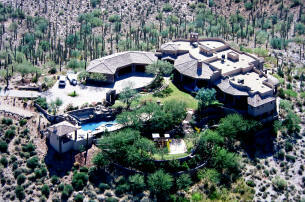 One Realtor in Chandler reports a home listed around $ 200,000 and 14 offers drove the selling price to around $ 310,000. You'll see some other columns in this month's edition that reflect this burgeoning feeling of confidence beginning to emerge. Consumers have been so beaten up lately, that even a few up days on the market, seems like a rally. Let's drink to that. . . .bottoms up! We've all learned not to get too far out ahead of occasional spurts of good economic news, and not to assume too early that the long-awaited real estate turnaround has arrived. But for the past few weeks the positives have been significant and sustained. You really can't ignore them. Take mortgage rates and new loan applications. Rates hit their low point in decades last week, and it looks like they're going lower in the wake of the Federal Reserve's announcement that it plans to pump hundreds of billions more into mortgage securities. Average thirty year fixed rates dropped to 4.89 percent, according to the Mortgage Bankers Association's latest national survey. Fifteen year rates hit four and a half percent with one point. Not surprisingly, loan applications are rocketing. Last week they were up by 21 percent over the previous week and are now 31 percent higher than applications were at the same time in 2008. A lot of the volume is for refinancing, but applications for home purchases are up as well. Meanwhile, housing starts took a surprise jump of 22 percent in February over January's depressed levels. Most of the increase was attributable to apartments and condominiums, but single family starts were up by one percentage point, and new home permits were up by 11 percent, after months of sharp declines. Even sales may be starting to stir in the depressed new home sector. A survey of sales at sixteen hundred new home communities in 80 metropolitan markets by John Burns Real Estate consultants found small but noteworthy "improvements in sales that can't be explained by just "seasonal " changes in buying habits, according to the study. On the west coast of Florida, builder John Cannon of John Cannon Homes told the Sarasota Herald Tribune that "there's a different buzz in the air (now) than we had sixty to ninety days ago. People are (suddenly) out there looking. Astute buyers know that they (can) take advantage of low pricing" and today's bargain financing rates. Too much optimism here? After all, unemployment keeps rising and the national economy is still in recession. But Fed chairman Ben Bernanke sees reason for cautious optimism about the months ahead. He told a national TV audience last week that the recession will likely be over later this year. "I do think we will get it stabilized" and then "pick up steam" as the recovery gets rolling into next year. But here's what we believe at Realty Times: Real estate as a sector will see its own recovery sooner than most sectors. The signs are pointing that way already.